Big or small all jobs are important! Protect your property’s foundation, doors, windows and lawn from pounding rain. Enhance the look of your home. We install seamless aluminum gutters and downspouts available in all sizes and colors. Copper gutters are also available. We offer 15 different types of gutter covers depending on your specific need (Pine needles, Leaves, ect...). Our employees are Leaf Relief certified. 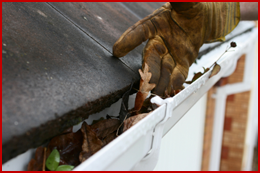 We offer regular maintenance for gutter clean outs, roof cleaning, French drains, woodwork and siding. We do free estimates and have a 5 year warranty on all work and a 20 year manufacturer’s warranty. Checks, cash and financing is available.